Ships from and sold by ONETOONESERVICES, LLC. 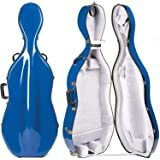 Interior dimensions: upper bout 13 3/4", lower bout up to 17"
The Bobelock 2000W Fiberglass 4/4 Cello Case with Wheels is considered by many cellists to be among the finest and most protective fiberglass cello cases available. This case has a beautiful green exterior with tan velour interior and offers suspension. 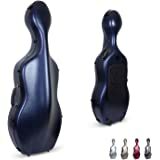 It features a convenient handle in rear portion of head when using the wheels for easy transport, a shoulder strap, two bow holders, and is sized for a 4/4 cello. 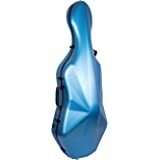 Practical, professional, and extremely well made, Bobelock cases are always a great value. I thought this case was awesome for what its worth. I had to get a good enough case to make it through the airplane ride for check in. I couldn't afford an extra seat for my cello so I took the chance. I put some padding bubble wrap, just to make sure my cello won't rattle in the case if the airline employee drops or throws it. You probably wont need it but just in case, you never could be too protective. I put fragile stickers all over and when it came back, some of the stickers were scratched and torn so you know it went through some kind of roughness. Checked my cello and it was perfectly the same. So the case really did do its job. I can't compare it to anything else but it locks up good, just gotta get in the hang of lining the latches up. Easy to roll around. It does have a little smell but not to where it was bothering me. Im thinking because its just brand spanking new and been stocked up for awhile. The quality and construction of the case are nice. I feel like my cello is well protected inside of it. However, there's a very, very strong odor inside of the case. I've tried everything to get rid of it by using febreze, airing it out for a couple weeks, etc., but no luck. Now my cello smells like the case. For the amount of money I paid for this case disappointed about the intense odor. Lastly, there is a pouch inside for holding items like rosin, a small metronome, etc. They only included a small piece of Velcro to keep the pouch shut, which isn't very effective. 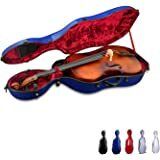 I've had items come out of the pouch while using the case which can potentially damage the cello if you're not careful. I've been spraying my case pretty frequently with Febreze with no luck removing the smell. I'm going to try spraying vodka in the case as a last ditch effort and thanks to a recent comment I received. 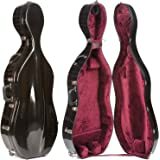 I recently went on a trip for about 5 days and left my cello in the case. I opened the case and the smell was pretty strong and its made my cello even more smelly. I'm going to bring my rating down for this product as a result. 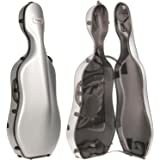 I honestly feel that my cello has been damaged to some extent due to the smell of the case. I hope that the manufacturer is reviewing these comments. I'll try to post an update after trying vodka to remove the smell. This case has worked well for me. It did have strong odor at first, but I just left it open in my garage for a few days and it's been fine. Occasionally, one of the latches will come undone and I'm not sure why. In addition to a double velcro fastener for the next, there's an elastic band to secure the scroll and the end pin.